Mobile office trailers are frequently used by companies who need to set up an office quickly, in a temporary setting, or in a remote area. 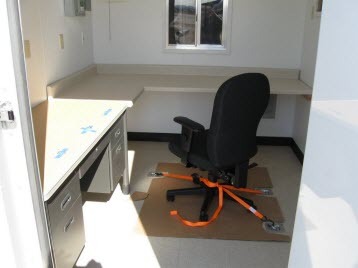 Once you understand the basics (mobile office trailers 101), you can get set up within the week. Do we need additional modifications such as extra outlets or windows? Do we need restrooms or running water? How soon do we need the mobile office trailer? Where exactly will the container go? Make sure your space is big enough for the container you're ordering. Now that you've made some mobile office trailer decisions, you’re ready to request a free quote from us. (We’re Falcon Structures, by the way. You might want to learn more about us.) If you aren't sure where to start, you can chat with one of our super helpful team members, who really do enjoy answering your questions. We’ve been doing this for more than 10 years, and there’s nothing we haven’t heard. If you're satisfied with your quote and have had all your questions answered, it's time to place your order! We regularly deliver to a number of states, but can facilitate shipping anywhere in the continental United States. The container will soon arrive at your location, and it will be time to set up your mobile office, using either professional movers or team members. Often, the container can be set up within a single afternoon. First, your container will be hooked up for electricity, running water, and plumbing. Then, you can commence moving in desks and files, setting up computers and other equipment, and placing any decorative touches. We understand that your needs for a mobile office are often unanticipated and urgent, and we work with all of our customers to ensure that delivery is as seamless as possible.